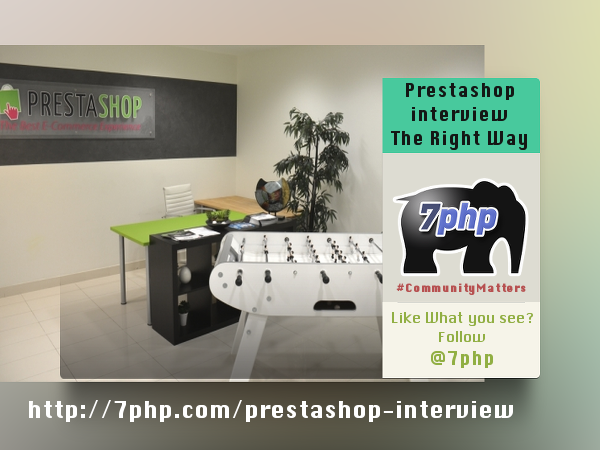 Prestashop – A 7PHP Comprehensive Interview You Don’t Wanna Miss! Showing The World Why PHP Is Amazing. Prestashop has been gaining a lot of traction down the last couple of years and 2014 has been a great year for Prestashop. I have been working on Prestashop for over a year for my best client ever which is Neopost France. I have been doing about anything and everything except theme design on it and even migrating an oldish version 1.4 directly to the 1.6 version. Needless to say that I was thinking of doing an interview. While Didier Ortega (technical Lead at Neopost France) was at the Prestashop conference back on the 19th November 2013, we were having live exchanges about what was happening as I was too much enthusiastic about such events. At the end of the conference, Didier (who likes what I do here on 7PHP) went to talk about 7PHP with Cindy Deguingand – PR and Event Manager at PrestaShop. We got in touch, she introduced me to their Lead Community Manager who was very friendly – so, inevitably, here we go with an interview with Prestashop! >> When was PrestaShop born – The story behind? PrestaShop was created in 2007 by our current CEO and Co-Founder Bruno Leveque. He saw the underdeveloped and complicated Ecommerce alternatives that made it challenging for small retailers to be successful online. He wanted to build an Ecommerce software that was both easy and powerful, while being 100% Free to use. >> PrestaShop kinda resurfaced with new motivation, vibration and success at some point around 2012. Could you tell us about this sudden successful bounce-back & the impact PrestaShop is having now as compared to when it started? We’ve been growing each year since the release in 2007. 1.4 was a success in 2011 and 1.5 was released in late 2012 with a new look. I think there was a lot of buzz surrounding the 1.5 version when it was released. PrestaShop’s impact has only been growing as more online retailers are switching to PrestaShop to power their online store for free. With the newest version 1.6, which was released in March 2014, the impact is greater than it’s ever been. >> The vision of PrestaShop, where is it heading and what does it want to achieve? PrestaShop wants to be the world’s most used and most loved Ecommerce software. We are committed to helping merchants succeed online from start to finish. >> What need did PrestaShop identified and how well is it serving that need? The need for a powerful, yet actually easy to use, software to sell goods and services online. >> Is PrestaShop already achieving his aim or is there still a long way ahead? We’ve helped our merchants sell over 15 billion dollars. We have over 185,000 active online stores. We are proud of what we achieved but we know there is still room to grow. >> “In March 2014, PrestaShop secured $9.3M in Series B Funding to Fuel Global Expansion”. Could you briefly comment on this successful funding? What are the plans of PrestaShop with this fund? This funding round will be used to fuel our international growth. We also want to use this funding to research into new product development and back fresh marketing campaigns. >> The awards that it has won so far? We win many Open Source Awards from around the world, Packt Awards comes to mind. We are voted as the Top Rated Ecommerce Platform from CMS Critic and The Best Free Ecommerce Platform in the “Seller’s Choice Awards” by Ecommerce Bytes. >> Could you tell us about its parent location/headquarters and is it physically present in other countries? We have a Global Headquarters in Paris, France and the North American Headquarters in Miami, Florida. In total we employee around 100 Ecommerce enthusiasts. >> Do you have remote employees also? We are hiring country managers to represent PrestaShop in their respected country with a mission to increase brand awareness, multiply our user base and identify strategic local partnerships. >> What is the revenue model of PrestaShop? With a strong user base, we have the pleasure of having industry partnerships with some of the best payment, shipping and marketing solutions on the market. We also have an Addon store where we support community developers who create quality modules and themes and sell them on the Addons store on a commission basis. Everything we do is for the merchant and their success translates into our own. >> What are the products that ‘PrestaShop the company’ offer? We do have SEO Audits, Merchant Training, and Developer Trainings. These are two day long extensive trainings with great follow up support. We also develop some of our own modules that are sold on the Addon store. >> Is PrestaShop in competition with other similar ecommerce CMS – could you list some? Being a free open-source software, we are committed to bringing the best quality ecommerce experience to everyone. We look at other Ecommerce solutions as colleagues that share the same values. The Magento Community was something we were watching. However, since they were acquired by eBay in 2010, they’ve focused more on large enterprise store which is not our priority. >> How would you convince someone to go with PrestaShop and how is it better than the others? PrestaShop is more powerful than the paid alternatives. PrestaShop is free and will always be free. The newest version 1.6 is beautifully designed and the code is easy to understand. Most importantly, using PrestaShop lowers the cost of ownership of running an online fees. There are no monthly fees and you are given everything you need to create a beautiful online store. We also give the best business intelligence insights available to an Ecommerce store owner. Of course, we have the most active Ecommerce community on the planet and it’s great to have such a large group of experts helping each other grow. >> Is PrestaShop aimed at small businesses and big ones alike? We are focused on helping any business small and large, succeed online. That said, PrestaShop is flexible and as powerful as any other software. Many large enterprise corporations as well. Any sized business can use PrestaShop but most of our merchants run small to medium sized business. >> The relationship between PrestaShop and The PHP Community – how is it contributing to The Community? The larger the PrestaShop community is, the larger the PHP community. Our 620,000+ user community has contributed to thousands of developers learning and advancing their PHP skills. On our forums you can find thousands of posts from expert PHP developers helping beginners learn PHP and spread the knowledge. >> PrestaShop has a list of certified web agency partners & it is mentioned that these are the best (“The cream of the crop”). How does PrestaShop judge that these are actually the best ones? What kind of quality check is done – could you please tell us a bit about the process involved. PrestaShop Certified Developers have to be trained by our team and pass a test to become certified. No other agencies have the type of insight into what our merchants are looking for and what their expectations are. That is why they are the best option for new merchants looking to have an agency build or improve their online store. >> If a company or a group of people wants to be featured in this list, what is the process to be done by them? >> Does PrestaShop offer any training or exams to them? What does the fees look like? The training comes with the certification. We also offer visibility packages on our website. The entire process including the optional visibility package is around $1-2K. The certification is free in the America’s and will be expanding free certifications if they show a strong knowledge in PrestaShop development. >> Can a certified web agency partner be a one-man show? Yes, but it would be listed under Freelance. >> Your message to people and companies that want to be a certified web agency partner with PrestaShop? PrestaShop Aand Some Concerns I Felt..
>> The price of the modules and plugins for PrestaShop is quite high ranging from $69.99 to as far as $384.99. – Why are most plugins’ prices so high? Our prices are consistent when you compare the industry. Many other ecommerce solutions charge anywhere from 50-200 dollars a month. Most of our Addons store are quality checked Community modules that we make little money from. It is a way to support the community by providing high quality and valuable Addons to help merchants make more money. >> Is there any quality check on those plugin? Definitely. The all modules and themes go through an initial automatic check of code quality. Then it goes through a manual technical check from our team. Next, it is sent to the Addons marketing team to check the marketing aspects. There is one final security check and then it is validated. The process can take up to 7-14 days. >> We will make the switch directly from 1.4.x to the new 1.6 – what is the best approach to take in this case. Have you had customers doing this kind of switch? Yes, but first I want to make clear that we don’t consider our users on PrestaShop as customers. They are part of our Ecommerce community that we grow by providing a completely free software. Thousands of our users have made the switch from 1.4 to 1.6 directly by using the Auto-Upgrade module. There are many blog posts on our website that go over some FAQ’s about upgrading and migrating to PrestaShop. >> In terms of the core aspects and architecture, it has changed a whole lot in version 1.5 and 1.6. Could you talk a bit about it and what caused this changed and how is the community reacting so far? 1.5 was released in 2012 but the core code between 1.5 and our newest version 1.6 is virtually the same. We wanted to make sure upgrades were going to be easy. We also addressed hundreds of community reported issues and preferences. The community loves the new look and feel of 1.6, the new analytic features are a great reason to upgrade and switch. >> What are the technologies, the framework and the tools used in building PrestaShop? PrestaShop is at the forefront of the latest innovative web technology, v1.6 integrates with Bootstrap 3.0, JQuery, FontAwesome, Sass Compass and D3 Data Driven Documents. >> And what is its architecture like, the design patterns and best practice used? >> Smarty Template is the templating layer chosen by PrestaShop. Could you tell us why this choice and why not use a better one like for example Twig? Smarty is one of the oldest and most trusted templating engines out there. I wouldn’t say Twig is better, it is new but comparable in performance. Actually in our many tests, Smarty proves better performance than other alternatives, especially when used with our compile and cache system. At the same time, many of our developer community members are familiar with Smarty and are comfortable using it. >> On the requirements’ page of PrestaShop, I see PHP 5.1+. Is it not time to be in line with PHP 5.4+ since PHP is deprecated till version 5.3 – Why is PrestaShop, especially 1.6 still there? These are not recommended requirements but minimum requirements. We need to remember that, although PHP is deprecated till version 5.3, there are many hosting companies with servers running older versions of PHP. PrestaShop runs just fine on these older versions of PHP but we recommend using a hosting company that has the latest version of PHP. All of our Hosting partners are indeed using PHP 5.4+ with optimized servers for PrestaShop. Because PrestaShop’s code is fully object-oriented, you can extend current functionalities or create new ones easily. We have an override folder that allows you to change core functionalities without affecting the actual core-code itself. The core code integrity is always maintained while keeping the scalability and flexibility available for developers. >> Best resource for developers to learn coding/extending PrestaShop? The first step would be to take a look at the Developer Guide. Next, I recommended the Developer training both Beginner and Advanced to master the PrestaShop code and become a true PrestaShop ninja. >> How active is the community around PrestaShop? We have the most active Ecommerce community in the world. If you go to our forum you will see thousands of merchants, developers and ecommerce experts sharing advice and helping each other every day. We’ve had thousands of GitHub commits come directly from our community. We simply love our awesome community and we thrive because of their dedication, creativity and talent in making PrestaShop’s code easier to handle and more powerful every day. >> For someone who wants to build an Ecommerce tool or at least learn how to do it, what is your advice? From where does he have to start and what to learn to get there? Figure out what you want to sell and make sure you can make a comfortable profit from each sale. It’s better to sell a few higher cost items than to sell many low cost items. Shipping is always important because if you ship manually, you must ship each package manually. This is why you want to strive for items that have a high average order value. To expand on that, you want to find a product that is more specific. In this day and age of online shopping, there are stores for every variation of products. Instead of jewelry, you can have for example owl jewelry. Instead of music supplies, you can specialize in drum sticks. With SEO going the way it is going, being more specific is better to start. Later, you can expand once you have a solid customer base. I can’t say any of it has been bad. It’s all a learning experience. There are things that we could have done differently with better results. All of our experiences make us better day by day. I’m happy with what we’ve done and what we’ve accomplished so far. We’re all excited for PrestaShop moving forward. Keep on being creative, showing the world why PHP is amazing. PrestaShop is mainly written in PHP. We accredit the strength, stability and flexibility of the PHP code to our global reach of developers. >> Do you want to add anything? Thank you for taking the time to write out these questions. I hope my answers were sufficient. 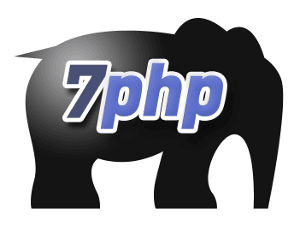 I can’t wait to see what more 7PHP will do soon!